Sir Mervyn can't be pleased. The MPC is in a hole. As in the US, growth forecasts were wrong all along. There were a lot of very embarrassed members of the economics staff at the Bank of England, this morning. They messed up and it is certain that Sir Mervyn was not pleased, as now the MPC is in a hole. More of that in a minute. First, we need some background. The Bank of England has put a good deal of resources into trying to understand the patterns of revisions to data in general and to GDP quarterly growth data in particular. Growth numbers are published by the ONS and then are revised over time as more data becomes available. So, not only is there uncertainty about where the economy is going, but also about where it is currently and where it was before. 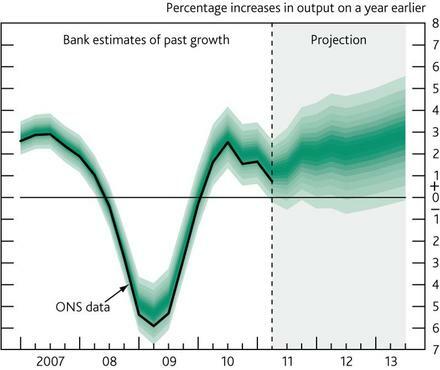 Over the past year or so, the MPC has based its forecast to growth and output not so much on the official ONS data but on what it thought it would end up being once it had gone through a revision cycle. So, here is the latest forecast of the MPC taken from its August inflation report (2011). Everything to the right of the dashed vertical line is the forecast and the green lines are the 90 per cent confidence interval, which widens as the forecast moves further into the future. To the left of the line is the backcast, which also has error bands on it showing that it is measured with error. The black line shows the official data from the ONS. The fact that the green lines are mostly above the black line means that the MPC was expecting the data to be revised up. It didn't turn out that way. The table below shows the old data and the new data. A few facts stand out. First, the extent of the decline in output in 2008 and 2009 was greater than was previously thought: that output fell by 7.3 per cent between 2008 Q2 and 2009 Q2, compared with 6.6 per cent, as previously estimated. Second, the fall in output now appears to have stopped in 2009 Q2, rather than in 2009 Q3. Third data for 2008 Q3 has been revised down substantially -- recall that the first release was + 0.2 per cent. Finally, output over the last three quarters did not grow at all compared with the 0.2 per cent previously estimated. Hence the staff and the MPC got it wrong and have collective egg on their faces. So did a number of others including Gavyn Davies, who in his blog article "Anglo Saxon GDP not as weak as it appears" argued on 1 May 2011: "It is quite likely that UK real GDP growth in the past two quarters will be revised up markedly from the zero rate which is currently estimated." Andrew Sentance has continued to argue that one of the major problems the UK faces is inflation, because the recession was much weaker than previously thought and the recovery much stronger. As ever, his analysis is negatively correlated with the actual outcomes. Kevin Daly from Goldman Sachs also claimed on 24 April: "Despite the uncertainty about the future, the UK's growth performance in the recent past has been better than is commonly portrayed." Wrong, chaps, sorry. This is almost exactly what happened in August 2008, when the MPC failed to see the recession, because it assumed the back data would be revised up but, in the end, they were revised down. The MPC's forecast is now going to have to be lowered even further, bringing it closer to that of NIESR, which has been very bearish -- and on the basis of these numbers, they are likely to lower their forecast even further, according to Simon Kirby. This means that the MPC has no alternative but to do more QE at its meeting tomorrow, proving Adam Posen has been right all along. The MPC can't afford to wait until November. I suspect also that some heads will roll at the Old Lady of Threadneedle Street -- and so they should. Embarrassing.